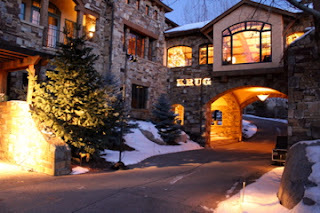 Last December I received an email from Champagne Krug, inviting me to series of tastings and fun holiday events in swanky Aspen. Krug is Champagne legend, the likes of which I had never tasted. I immediately began plotting how my wife and I could arrange childcare for our nine-month old and make our way to Aspen on only a few days notice. However, given the short notice, we couldn’t make a weekend of it so I decided to drive there and back in the same day. After all, wine with a reputation like Krug is a worth driving for eight hours (round trip). I set out early in the morning to make my one o’clock appointment. When you have an interview set up with Krug’s winemaker on her first visit to the United States you make sure you get there early. After a long drive with all the ski traffic, I made my way up the mountain roads of Aspen and pulled to up a palatial house with only a large bottle of Krug at the end of the driveway announcing that I had found my destination. The impressive front doors opened to a display of the family of Krug wines along with names of each generation of Krug on the walls of the winding staircase. 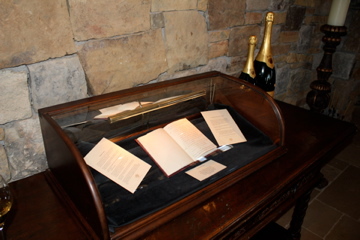 The original journal of Joseph Krug, describing his philosophy for Krug, was displayed beneath a glass enclosure at the top of the stairs. As I walked around the house sipping a delicious glass of Grande Cuvée, I took in quotes describing the sublime properties of Krug that decorated the walls and mirrors of the beautiful house. A group of local industry members gathered on a series of oversized couches to listen as U.S. Brand Director Carl Heline led an impromptu tasting. 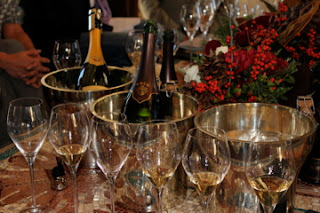 I savored each sip of Grande Cuvée, Krug Rosé, Krug Vintage 1998 and the unreleased Vintage 2000. “Pop the cork,” says Krug US brand director Carl Heline as he sits on an overstuffed loveseat in front of a warm fire. “The sound gets Champagne into people's minds. Why have we spent so much time teaching people to keep the cork quiet?” Wine is meant to be enjoyed with all of your senses. Some wines’ value is determined by the uniqueness of their labels. The intensity and clarity of a wine’s color offers insight into age, pedigree and flaws. Before you can taste the elixir, your nose is tantalized by a wide array of aromas that conjure scents of days and meals gone by. Not only does your tongue sense a flurry of flavors, wine offers a physicality of sorts with the variety of textures that fill the mouth. But what about your ears? Do your ears get nothing from drinking wine? This is where Champagne fills the void. Heline described the history of this most famous of Champagne houses. “From 1843 to 1984, Krug only had only two wines, the Grande Cuvée (the style of the house) and the vintage (sometimes),” Heline explained. “The reputation of Krug has been made on those.” In the past few decades, Krug added to its small family. “Thanks to the process of Grande Cuvée, there is one plot in Mesnil sur Oger that they [the Krug tasting panel] tasted as a single plot for years, and felt from 1971, when the Krug bought the chardonnay, to 1979 that this plot was very unique. So they decided, as an experimentation, in 1979 to put only that plot, which is only chardonnay from only one year from the Mesnil su Oger into bottle.” This wine is of course known as Clos du Mesnil. While Krug may be one of the most famous names in all of Champagne, they are joined by several other stellar negociant houses under the umbrella of owner LVMH’s wines and spirits division. Moët & Chandon, Dom Pérignon, Vueve Clicquot, Mercier and Ruinart are all other top negiociants that Krug calls family, but only to an extent. “Dom Pérignon is our biggest competitor and we are in the same company,” concedes Heline. “It is easier to sell Dom Pérignon because people don't understand the multi vintage philosophy of Grande Cuvée.” There are other disadvantages to working as a part of a large corporation such as the bureaucracy, planning, and the time needed for decisions to go up the hierarchy. Despite these struggles, Krug operates fairly autonomously but does have the advantage of LVMH’s nearly limitless resources at its disposal. Heline proudly explained that Krug has been given the task of producing the best wine possible. Whatever tools the winemakers need to get that done are provided by LVMH with no hesitation. Krug also can utilize importer and distributor Moët & Hennessey’s wherewithal to sell its wine all over the world. Even though Krug is owned by a larger conglomerate, they still operate as if they were a small grower house. Heline continued by describing what, in his view, makes Krug unique: plot separation and selection and the subsequent tasting of the wines. Krug owns (20 ha) and buys grapes (50 ha) from over 250 individual plots in Champagne. They vinify and age each plot separately. Only after a select group of Krug employees, seven to be exact, taste all wines individually, are the components for the different wines determined. Grande Cuvée will be a blend of some 120 wines from 10-12 different vintages which may reach up to 15 years of age. Heline explained that he likes to lead tastings he described as “a single point to the universe.” He starts with Clos du Mesnil, a wine from a single plot, from a single grape, from a single year. Next comes a vintage Krug, made from all three varieties, from select plots, but still from a single year. Finally, Grande Cuvée represents the universe; a wine made from all three grapes sourced from over a hundred plots from many different vintages. It is through this unique and prestigious tasting group that these wines are expertly crafted. So, that plot selection has been going on for over 170 years now. As much as today, the first fermentation process in oak wood is unique and this is something Krug will insist on because you still hear sometimes that Krug is special because it is aged in oak wood. Krug does not age in wood, they only do the first fermentation in barrel. And if you hear that Krug is special because Krug does first fermentation in oak barrels, that is also misguided, clarifies Heline. “Not because we don’t do it, but because this is not why we are special. Krug has always been special,” Heline described magazines and papers from 1866 describing the winemaking process in Champagne. At that time, everyone was doing the first fermentation in oak wood barrels because stainless steel tanks did not exist. Across from Leon-Grillon and I sat Krug’s PR representative from Bismark Phillips Communications and Media, Sarah Pallack. I asked her to discuss how Krug is using social media to reach new wine drinkers such as Millenials. Krug wine has long been confined to a small group of devoted wine connoisseurs. Pallack explained that the long-term goal for Krug isn’t to just reach the loyal Krugists, as dedicated Krug Lovers are sometimes affectionately called, but to share the idea of Krug in a more organic way to all pleasure seekers. Cultivating Krug Lovers is second in importance only to crafting the wine at Krug. Pallack declared that social media is a relatively easy way to spread the message, increase awareness and simply facilitate sharing of happiness. “The best way to reach people who cannot come to the winery or Krug House is digitally,” said Pallack. As such, Krug launched a Facebook page in late 2010 and has just started using Twitter and Tumbler. While many so-called cult wineries of California have been afraid to use social media because it might damage their reputation, Krug is fully embracing it. Finally, it is about time I get to the whole reason I made the journey: the wines. As I stated before, four different wines were open during my visit. Grande Cuvée, Krug Rosé, Krug 1998 and Krug 2000. All were different, but spectacular in their own right. Most wineries, and particularly Champagne houses, have a hierarchy of their wines. At the bottom is the non-vintage blend, then comes the rosé with vintage-dated wines at the top unless a super Cuvée or single-vineyard wine exists. If you believe that vintage is always the best, which is true in 99% of the time, and if you don’t know the process behind Grande Cuvée, you won’t fully appreciate Krug. Grande Cuvée is definitely the cheapest of the five Krug wines, but not inexpensive by any means. In fact, Grande Cuvée is more expensive than many other tête de cuvées such as Dom Pérignon and La Grande Dame. Krug’s prices only go up from there. And as I found out and as Heline explained his personal preferences, with Krug, price is not equivalent to quality, but more indicative of scarcity. Grande Cuvée is the least expensive because it is has the largest production. The two single vineyards (which I did not get a chance to try), are so rare they are priced accordingly. For me, the Grande Cuvée was the most complete wine of the bunch. Aromatic, full of flavor and acidity with enough length to keep you satisfied on a long-distance run. It was doughy, yet with a burst of citrus and a touch of salted toffee. After tasting all four, this was the wine to which I went back for more. The rosé was astonishing for its depth of red fruits. Cranberry and strawberry flavors burst in my mouth and complemented the still persistent toastiness. The two vintage wines were fabulous nonetheless, but seemed to lack something that the Grande Cuvée provided. Though, as Heline had described, Krug doesn’t necessarily make a vintage wine in the best of years, but only declares a vintage when it thinks that the wines of that year can tell a story about the vintage. The 1998 was rich. The autolysis of the lees was most prevalent in this wine; lots of toast topped with orange marmalade. The finish was exceptionally long. The 2000 was a bit softer and lighter. The nose was more subtle and the citrus flavors were much more acidic. To me, the 2000 was more like a flaky pastry with lemon zest. All four wines were easily some of the best sparkling wine, no, make that some of the best wine, that I’ve ever had.